Cul de Sac / Damo Suzuki - "Abhayamudra"
This astounding release definitely does make sense. Ex-Can singer Damo Suzuki met the Boston based Cul De Sac for a several months long tour that led them through the US and Europe. Can, of course, WAS genuine Krautrock, and if you want to enumerate contemporary Krautrock bands you rather don't want to mention any bands from Germany (with very few exceptions) but US bands like ST 37, Skye Klad, Mushroom or Cul De Sac. Some years ago Damo Suzuki had invented the concept of "instant composing" for his Damo's Network project. Instant composing is different from free improvisations where there's usually a theme for each tune, and the musicians, especially the soloists, are free in their contributions within the framework of the respective tune. In opposition to this instant composing means no themes, no rehearsals, no prepared tunes - just going onstage and starting to play right away, following "free associations" (in Freud's terms) or the "stream of consciousness" (in terms of literary criticism especially concerning the writing principles of novelists like Marcel Proust or James Joyce). You can't make any mistakes within a concept like this, if you are an experienced musician? Well, you can! 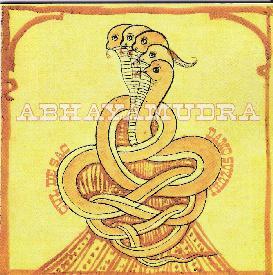 "Abhayamudra", unfortunately, is altogether not a good record and therefore no good example for the concept of instant composing (at least not for "beginners"). The reason is that in more than just a few tunes there's almost no interaction/communication among Damo and the band, not even among the band members. In most of the tunes on this double-CD everybody is almost autistically doing his own thing, or they're doing rehearsal room warm up basics. There are moments when Cul De Sac are playing "behind" Damo in the style of a backing band for a "star" solo artist, but in most tunes Damo isn't disposed to act like a star in front of a band, in some cases he even exhibits severe intonation problems. And this leads to an other shortcoming of this release. If the concept of instant composing would haven been taken seriously throughout the album, you as a listener would not be able to tell intentions from mistakes as there would be no recognizable difference between them. In many tunes on these CDs you hear sonic intentions and the failure to achieve them. But does this make this record worthless? No, of course, not. The reason is that in principle instant composing is a "strong" concept. And like strong theories in science strong concepts in the arts and humanities are those most likely to fail, and this is what does make them strong and informative. So, on a meta-level, "Abhayamudra" is an important record, not only for those who've seen Damo Suzuki and Cul De Sac live on stage during the tour where the tunes were grabbed from. Like a contradiction to what is said above stand two marvellous pieces, the closing tunes of disc two with the names "Berlin 3" and especially the 18 minutes long "Zagreb 3". Here you witness the almost revolutionary concept of instant composing with its ability to open new musical horizons and leading the listener to the unknown and unexpected. Here you find that kind of dense communication among musicians this concept stands for. These tunes, together with "Beograd 6", the opening tune of disc two, and maybe "Berlin 4" from disc one would have justified one CD that could be regarded as "great". The problem seems to be that of selection and exclusion, and this will also be the case for two new double CD releases on Suzuki's own Damo's Network label - scheduled to be put out sometime later this year - this reviewer had already the opportunity to listen to. Some listeners will surly appreciate this for documentary purposes. Another reason to release all this stuff almost at once might be the intention to secure a lifetime's work, but this also bears the danger of inflation. For more information you can visit the Strange Attractors Audio House web site at: http://www.strange-attractors.com. Contact via snail mail c/o Strange Attractors Audio House; PO Box 13007; Portland, OR 97213. Visit the Damo Suzuki web site at: http://www.damosuzuki.com. Visit the Cul de Sac web site at: http://www.culdesac.org.